“What’s your market?” is typically a softball question for startups. 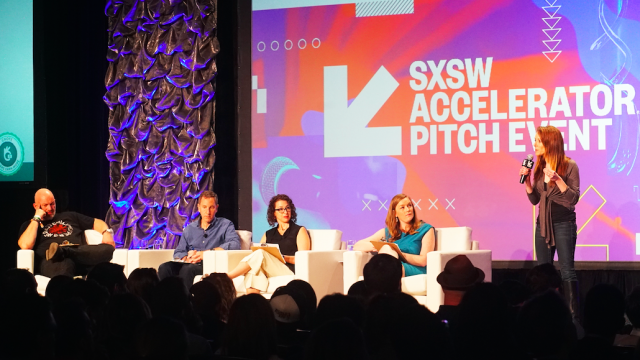 But for many of the 50 companies pitching in ten categories during the ninth annual SXSW Accelerator Pitch Event, defining the ideal customer for their pioneering innovations wasn’t so easy. Fortunately, we all benefit from the inventive and ingenious minds solving tomorrow’s problems in industries like health, virtual reality, and cyber security today. View the list of all finalists and alternates here. Congratulations to this year’s ten category winners, who were announced at the SXSW Accelerator Awards ceremony after the two-day competition. Learning a foreign language? Practice any language with a native speaker, in person, at one of Lexody’s suggested local meeting places. If you missed any of the pitches this weekend you can still meet each of the 50 finalists at the Accelerator Demo Days Monday, March 13, from 11 AM to 1:30pm in Salon C at the Hilton Hotel. But we’re not done yet. New this year is a Super Accelerator Pitch Event at 5pm Monday in Ballroom EFG at the Austin Convention Center. All ten category winners will be back on stage to pitch once again in front of a new audience and a new set of judges. This competition will select the 2017 Best Startup Pitch Company. Hats off to the winners and judges for a job well done. And, we hope to see you at the Super Accelerator Pitch Event! For more information about Accelerator, go to our website at sxsw.com/awards/sxsw-accelerator. Learn more about the Monday, March 13 winner of the first ever SXSW Super Accelerator Pitch Competition, CNote, here.